The Department of Transportation (DOTr) and the Land Transportation Office (LTO) was recently cited by the Commission on Audit for having been able to meet a 90-percent achievement rate in registering new vehicles and issuing them Motor Vehicle plates and stickers within 7 days. Now, unless every new car owner belongs to the 10 percent without Motor Vehicle plates, everyone knows this isn’t the case. Despite the DOTr getting new MV plate manufacturing units, they’re facing a huge backlog that stretches all the way back to 2016. 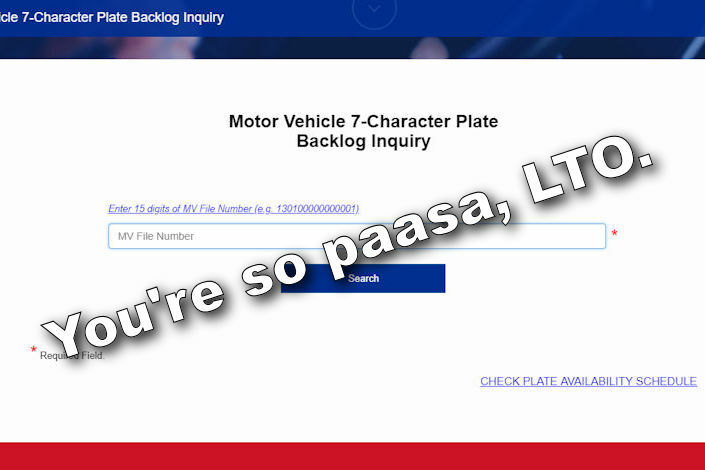 For the sake of transparency (and perhaps as a way to kill some time and bandwidth at the office), the LTO now launched an online portal where people can check the availability of their plate numbers. Naturally, we just had to put this to the test. You can access the site here but take note that you need to enter the 15-digit MV File Number correctly. The website does not accept a wrongly-entered or partially-entered MV file number. Any corrections will necessitate a re-load. Wow, LTO. Paasa lang kayo. This is certainly bringing back memories of me waiting for my crush’s text back in college. Okay, it’s a bit unfair since the vehicle in question had an initial registration date of April 2017 and the LTO said that 2016 MV plates are the one being issued first. Here’s hoping our plate number gets issued before the end of 2018.